Pres. 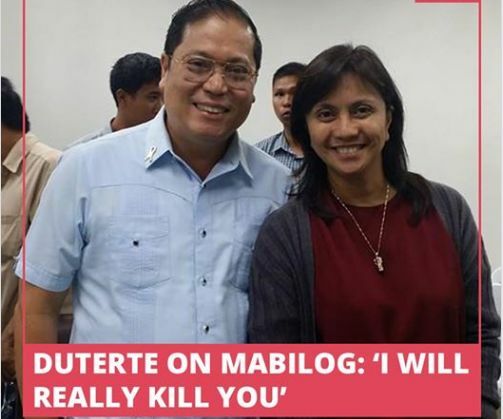 Rody Duterte did not mince words with controversial Mayor of Iloilo City, Mayor Jed Patrick Mabilog as he warned the former official not to return to the Philippines or else he will kill him. The suspected narco-politician from Iloilo was already threatened previously by the President. The statement of Pres. Duterte was made by the chief executive during his visit at Mabilog's home turf as one of the honored guest in the Philippine Councilors League (PCL) Assembly. The stern warning of Pres. Duterte was made in the middle of his speech and also issued against officials involved in the illegal drug trade as he looked for the former Mayor in his audience. Pres. Duterte was quoted as saying “Saan ang mayor ninyo dito? Saan na ‘yung pinalitan mo Mayor? Saan ba si Mayor? [Where is your mayor? Where is the person you replace, mayor? Where is mayor? ]” Duterte said before a national assembly of councilors in Iloilo City. “Sinabi ko sa kanila, ‘magbalik ka dito sa… T*** i*****, patayin talaga kita’ [I told them, if you return home, son of a b*tch, I will really kill you],” he added. The President has accused Mabilog as a suspected protector of drug syndicates, who has allowed Iloilo to become the “most shabulized” province in the country. Former Iloilo City Mayor Jed Mabilog, the cousin of Sen. Franklin Drilon has denied the President’s allegations and left the country to allegedly seek medical treatment last year. He was later removed from his post by the Office of the Ombudsman for failing to declare his true wealth. In his speech in Iloilo, the President warned anew mayors against getting involved in illegal drugs or else face fatal consequences. “Itong mga mayors ganito. If you are into drugs, you better shape up. Huwag mong patayin ‘yung mga pulis na ayaw sumama sa racket mo [Don’t kill the policemen who refuse to join your racket],” he said. “Kasi ‘pag ginalaw mo ‘yung pulis — military, individually they are helpless. Pero kung ang gobyerno na kalaban mo, p****** i** patay ka talaga [If you intimidate the police, military individual, they are helpless. But if you fight the government, son of a b*tch you’ll be killed],” he said. He said the mayors would be “playing with fire” if they would kill policemen who refuse to join their drug operations.